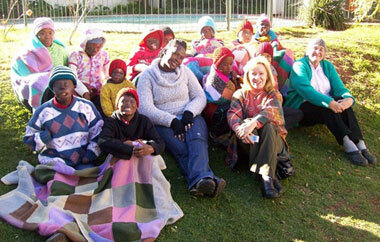 Members of the Midrand Presbyterian Church were busy knitting in 2011 and kindly gave blankets and jerseys to Children of Fire. Some the children will keep but much will be handed on to fire survivors in the bitterly-cold Highveld winter. This material is Copyright � The Dorah Mokoena Charitable Trust and/or Children of Fire , 1998-2019. Distribution or re-transmission of this material, excluding the Schools' Guide, is expressly forbidden without prior permission of the Trust. About Children of Fire | Contact us | Advertise with us COPYRIGHT � 2019 Children of Fire. All rights reserved.